NOKIA acquires French health gadget maker Withings for €170 (EUR) million. Nokia has today announced plans to acquire Withings S.A., a pioneer and leader in the connected health revolution with a family of award-winning digital health products and services. 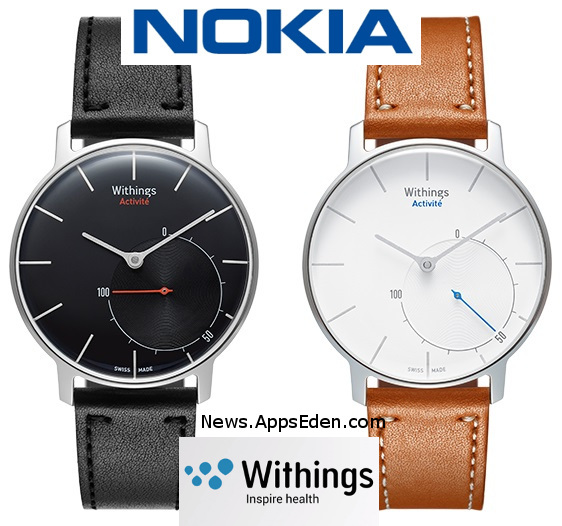 Withings will be part of Nokia Technologies business. The planned transaction values Withings at EUR 170 million and would be settled in cash and is expected to close in early Q3, 2016 subject to regulatory approvals and customary closing conditions. "We have said consistently that digital health was an area of strategic interest to Nokia, and we are now taking concrete action to tap the opportunity in this large and important market," said Rajeev Suri, president & CEO of Nokia. "With this acquisition, Nokia is strengthening its position in the Internet of Things in a way that leverages the power of our trusted brand, fits with our company purpose of expanding the human possibilities of the connected world, and puts us at the heart of a very large addressable market where we can make a meaningful difference in peoples' lives." World Health Organization figures show cardiovascular disease as today's number one cause of death, with more than a billion adults around the world living with uncontrolled hypertension. Diabetes now affects more than one in twelve adults worldwide, a four-fold increase since 1980. Healthcare is expected to be one of the largest vertical markets in the Internet of Things, with analysts forecasting that mobile health, with a CAGR of 37%, will be the fastest growing health care segment from 2015-2020. "Withings shares our vision for the future of digital health and their products are smart, well designed and already helping people live healthier lives," said Ramzi Haidamus, president of Nokia Technologies. "Combining their award-winning products and talented people with the world-class expertise and innovation of Nokia Technologies uniquely positions us to lead the next wave of innovation in digital health." The combination of innovative products from Withings and the Digital Health business will also ensure the ongoing renewal of Nokia Technologies' world class IPR portfolio. Withings was founded by Chairman Eric Carreel and CEO Cedric Hutchings in 2008 and is headquartered in France, with approximately 200 employees across its locations in Paris, France, Cambridge, US and Hong Kong. Withings' portfolio of regulated and unregulated products includes activity trackers, weighing scales, thermometers, blood pressure monitors, home and baby monitors and more, and is built on a sophisticated digital health platform, providing insights to empower people to make smarter decisions about the health and wellbeing of themselves and their families. Withings' own products are complemented by an ecosystem of more than a hundred compatible apps. "Since we started Withings, our passion has been in empowering people to track their lifestyle and improve their health and wellbeing," said Cédric Hutchings, CEO of Withings. "We're excited to join Nokia to help bring our vision of connected health to more people around the world."